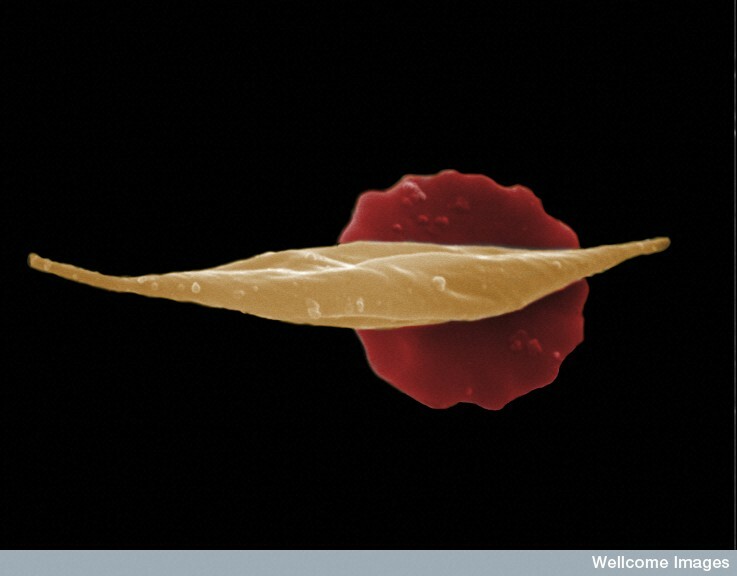 Normal red blood cell (background, coloured red) and red blood cell affected by sickle-cell anaemia (foreground, coloured red). Sickle-cell anaemia is a blood disease that causes the cell to form a characteristic sickle-shape. This change in shape affects the cell’s ability to carry haemoglobin (an iron-rich protein that gives red blood cells their colour and allows for efficient oxygen transport). Sickle-cell anaemia results in abnormal blood flow and a reduction in the red blood cell count. It is a genetic disorder that results when an individual has two copies of the relevant gene. It is common in countries in which malaria is prevalent, as carrying one copy of the sickle-cell gene provides advantageous resistance to malaria and is known as ‘sickle-cell trait’.